I would like to submit my new puppy Bishop from Calgary AB Canada. 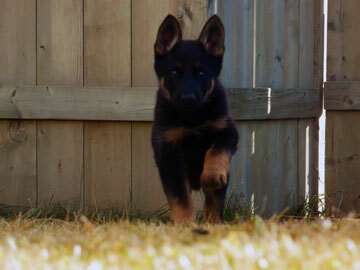 In this picture he is about 9 weeks old running in the backyard. He is a black and tanned P/B. What a handsome young German Shepherd puppy you have there. I bet he is 100 to nothing all the time, huh? Good luck with your new house mate - and with all that teething you will see be dealing with. Do yourself a favor and get loads and loads of chew toys! Your German Shepherd puppy Bishop reminds me so much of my own German Shepherd puppy. Color wise, they could be brothers. It is really amazing - my German Shepherd puppy is just over a year old now. How is Bishop doing now? Is he still dark like in the picture above? Thanks for sharing your handsome GSD puppy Bishop with all the other German Shepherd puppy lovers on this wonderful German Shepherd lovers website. It's like a German Shepherd puppy and dog library isn't it? I really enjoy coming here and seeing all these great stories. You'll never be sorry that you got your little German Shepherd puppy Bishop. And he will always be your best man! All I can say is awwwwwww! That picture - oh man! I about feel off my chair when I saw that adorable picture of your beautiful German Shepherd puppy Bishop. That is the most adorable German Shepherd puppy Bishop ever, ever, ever. Just makes me want to get a German Shepherd puppy all my own. I just love puppy breath - yeah, some people think that that is weird. But it is just like smelling in the essence of a German Shepherd puppy right through its little mouth. He is so beautiful. And I wish you the best of luck and many, many, many years with him. Thanks a lot for sharing.